The infamous Tezos was developed by ex-Morgan Stanley analyst Arthur Breitman. It took two weeks to gather around $230,000,000 both in Bitcoin and Ether contributions, which put Tezos to the biggest ICOs ever in terms of raised funds. It took a long time for the project to start after some scandalous legal issues, including claims from U.S. Securities and Exchange Commission (SEC) and the step-down of one of the co-founders Johann Gevers (read the full story). Tezos Foundation now hired professional auditors from a well-known PwC company to resolve all current and upcoming issues in the legal field. However, Tezos made it out good in late 2018 and released the mainnet on 17th of September. The developers’ activity and the recent ~90% increase in value (after the Athens A proposal was approved lowering the staking deposit to 8,000 XTZ and increasing the gas limit) raised our concerns about Tezos price predictions for 2019 and further years. 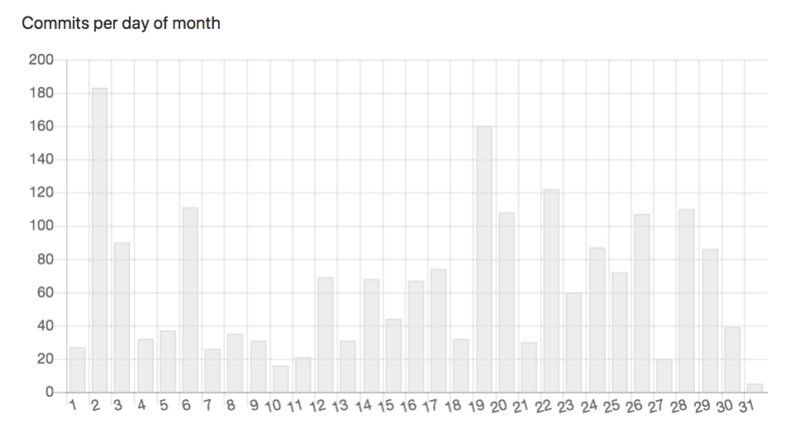 Tezos’ blockchain development is very productive according to their mainnet gitlab statistics, the snapshot data range is from February 08 to April 08 2019. What is Tezos (XTZ) Coin Value? Tezos codebase is written and operates on OCaml, a functional programming language. It is platform for decentralized applications and smart contracts. Tezos coin ticker is XTZ, and it’s mining process called “baking” with a Delegated Proof-of-Stake consensus implementation which includes a “witness” who verify the baked blocks for economic incentives. Bakers must deposit (or gain it from other XTZ holders) of at least 10,000 XTZ to be active in the process of signing and publishing blocks. According to the project’s white paper the algorithm behind the Tezos blockchain is referring to the Vitalik Buterin, Ethereum founder, work on a punitive proof-of-stake consensus called Slasher. Still, Tezos has its distinctive feature – self-amending blockchain with decentralized voting for new proposals. Take a look at what cycle each protocol proposal have to pass in order to be approved. So there is no need for forks or hard forks in the Tezos blockchain, it just happens automatically with the approval from a majority of XTZ holders. Worth mentioning, Tezos’ programming language for dApps differs from Ethereum Solidity in the formal code verification which mathematically proves that the written code complies with the protocol properties and helps developers to avoid crucial errors which, for example, resulted in stolen funds during Ethereum DAO hack in 2016. Despite the obvious progress in the development of the project, Tesos has a lot to do in order to catch up with the leaders among the dApp platforms. Although the nature of decentralized governance is attractive to many crypto enthusiasts, the Tezos community must go through a growing phase and prove its effectiveness in decision making. Before we begin, let’s examine the price rise of XTZ after the Athens A proposal was approved at the first cycle of Tezos’ amendment process. 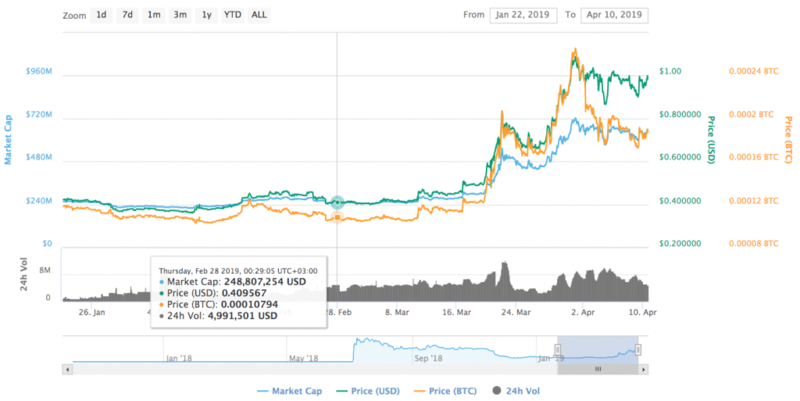 Tezos price chart on Coinmarketcap.com, from Jan 22 to Apr 10 of 2019. 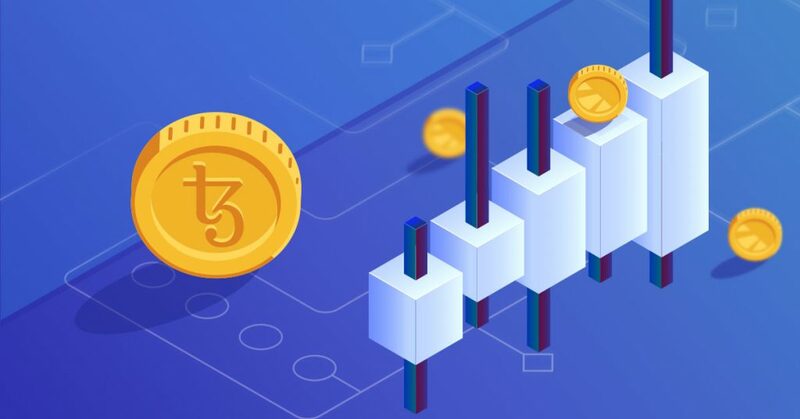 The staking deposit decrease, increased gas limits and the first community-driven development proposal all together brought Tezos coin price back from $0.4 to $1.08 USD (token price at the moment of ICO sale was 0.47 USD). The highest price of $12.19 USD was reached on the 17th of December 2017 when all crypto market was rising in the biggest cryptocurrency bull-run. Undoubtedly, there will be more difficulties and opportunities for Tezos price to grow, like some recent events with a positive impact on XTZ price. This may lead to XTZ listing on the Binance exchange and most of the time it skyrocket the price. Very happy to announce support for @tezos $XTZ — securely and conveniently send and receive (staking coming Q2) from your #TrustWallet. Special thanks to @tezoscommons on adding support for #Tezos to the Trust Wallet Core libraries. Coinbase Custody announces the launch of Tezos ‘baking’. This is huge for Tezos as it could bring big investors attention to the coin. The TradingBeasts expect a slow and steady price grow to reach the range of $1.03 USD per coin at the end of 2019. According to the recent local price maximum of $1.06 this prediction has to be adjusted. The price of Tezos may drop from 0.981 USD to 0.182 USD. The change will be -81.430%. This could be true if the situation with U.S. SEC won’t be resolved in favor of Tezos or the cryptocurrency market trend will change again to bearish. There is no obvious reasons for the XTZ price fall for now. We expect a certain price correction after the recent rise, possibly to the range of $0.6-0.7. It is a good opportunity to buy XTZ since the project has just begun its active development on their mainnet and will continue to generate its technological and market value. In the last quarter of 2019 we expect the Tezos price to be in the range of $1-2 depending on the upcoming news. Still, this is the altcoin without mass adoption as a dApp platform and the competition is high here. Only the bullish continuous trend for all cryptocurrencies could lift the price above the ATH level of $12. Current Tezos price is $0.99. Pretty conservative as for me. What’s your forecast? If we see another bull market, expect minimum 20X, so $20 will be conservative. Also that $11 ATH was pretty fake on a tiny exchange with extremely low volume (think a few thousand dollars trading). Also let’s not forget that Coinbase just announced XTZ baking/staking for institutional investors… guess what happens next? Coinbase will list XTZ… that should be good for 20-50%. Eventually it will hit binance, bittrex etc… that will be another 50%… then understand that Tezos is *already* what Cardano is trying to become, except Tezos is 1 – 2 years ahead of Cardano development wise. ANd Cardano right now is $2B, Tezos $700M, so there’s another 2.5X. Yep, that is mentioned in the article. However, coin listings are not always have an impact on price. Could you be more specific about misinformation?